SLD Pumps and Power, a division of Carrier Rental Systems (UK) Limited, has announced the introduction of an innovative de-silting settlement tank technology to its hire fleet. The de-silter has been introduced to help reduce the risk of sediment pollution and of sludge deposits entering watercourses at pumping project locations. “This is a response to increasing environmental awareness and sensitivity by our clients even on the smallest of pumping projects”, explained Neil Lewis of SLD. “The reliability and effectiveness of this innovative product is so crucial that we tested its capabilities at Cardiff University Department of Engineering before introducing it to the marketplace”. 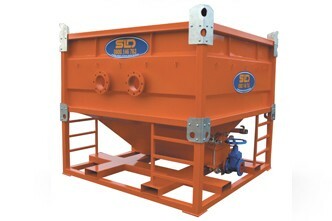 The de-silter system treats liquid run-off contaminated with suspended particles without the use of chemical coagulants. Test results have shown that the SLD de-silter is very efficient at trapping sediments in all cases. The optimum sediment removal efficiency was found to be 98% at an inlet solids content of 30 g/I and a flow rate of 40m³ per hour. This demonstrates that the system is effective and has practical application in industry. In the tests the efficiency of the SLD de-silter was determined under real operating conditions with three inlet solid content ranging from 10 g/l 30 g/l.